Doors. I'm fascinated by pictures of doors and windows. They always suggest possibilities to me. What's behind those doors and windows? So, I was immediately sucked into Brian Grazer's comments about curiosity in the book he co-authored with Charles Fishman. In the introduction to A Curious Mind, he says, "For me, curiosity infuses everything with a sense of possibility. Curiosity has, quite literally, been the key to my success, and also the key to my happiness." Brian Grazer is the producer of A Beautiful Mind, Apollo 13, Splash, and J. Edgar, among other movies, with his business partner, director Ron Howard. For his entire life, Grazer has been curious, a trait encouraged by his grandmother. He used that curiosity to get his first job in movies, to meet some of the biggest names in the film industry, and, then to branch out to have "curiosity conversations" with innumerable people from Dr. Jonas Salk to Senator Barack Obama to Princess Diana and Michael Jackson. Although the book touches on some of those conversations, Grazer's purpose is actually to discuss curiosity itself. Grazer challenges readers to ask questions. 'The ability to ask any questions embodies two things: the freedom to go chase the answers, and the ability to challenge authority, to ask, "How come you're in charge?"' And, he reminds us there are countries where people are imprisoned for answering questions. He says, "Curiosity is itself a form of power, and also a form of courage." And, he discusses all those institutions where innovation and creativity is encouraged. But, who is encouraging curiosity, essential to both of the other traits? And, those curiosity conversations? He calls that emotional curiosity. He wants to know what makes people tick. When Grazer relates anecdotes about his workplace, and his methods of questioning staff, he includes suggestions for supervisors trying to learn what makes their staff tick. A Curious Mind is a fascinating book. It's a peek inside Grazer's own mind, as well as an investigation of curiosity itself. And, despite the fact that the book isn't about the curiosity conversations themselves, the list of people Grazer met with is awe-inspiring. The man, the producer, who sees his work as storytelling, succeeds in telling his own story as an example of curiosity in work. If you're curious about curiosity and its possibilities, A Curious Mind: The Secret to a Bigger Life is an excellent choice. 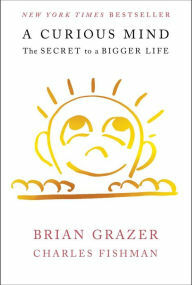 A Curious Mind: The Secret to a Bigger Life by Brian Glazer and Charles Fishman. Simon & Schuster. 2015. ISBN 9781476730752 (hardcover), 300p.